I don't know about your babies, but mine are..........well..............slobs! I am constantly cleaning up pee, poop, and puke! Thankfully most baby items are made to be washed. Sure, it means I'm doing a lot of laundry (a LOT of laundry) but things are clean, and that's important to me! Well, the playard has been around for a while. My mom had one for my little sister 22 years ago, so they've been here for at least that long, probably longer. Why they weren't originally designed to be machine washed is beyond me. Why companies are STILL making ones that are not designed to be machine washed is baffling. FINALLY, InGenuity has heard the cries of moms everywhere and has designed the first machine washable playard. Yep, you heard me right. You can finally have a clean, pee, poop, and puke free playard for your children......especially those 2nd and 3rd children getting the hand-me-downs. InGenuity sent me their brand new Disney Baby The Lion King Premier Washable Playard to review in our home, much to my delight! It came almost fully assembled, and what was left for me to assemble was quick and easy. I had the entire thing set up and ready to go in less than 5 minutes. When you look at it, this playard looks a lot a lot like others you've seen. It has all the features you're probably looking for. You've got the standard playard, plus the bassinet option, plus a diaper changing station. The reason this playard is 10x better than any other playard you've used is the machine washable factor! It's amazing how you can take this thing down to basically its framework and really get it clean! I (well, with my husband's help!) created a quick video which shows how you assemble and disassemble the playard for cleaning. It takes less than 10 minutes to take the whole thing apart and put it back together again. I'm sure with time it will get easier and quicker as well! So, now that I've talked about and showed you my favorite feature of this playard, let me tell you about some of the other great features you'll love! First, I love the Lion King theme. It's so cute and yet not too over the top. I love the color scheme that was chosen for this. It looks great in my living room. The playard has a cute Lion King themed toy bar that my son really seemed to enjoy looking at. There is also a little Simba on the mat that grabbed his attention. They playard has wheels but you'd never know it! They are cleverly hidden, which helps maintain the stylish look of this playard. Also, a soothing sound station is included so you can play music or nature sounds for your baby. I'm not sure about your kids, but I have found that background noise or music really helps when they are sleeping! Second, lets talk about the diaper changing station. There is room to store your diapers, wipes, creams, and even an extra outfit if you want. The cover over the diaper changing station is also washable or wipeable for small messes. Not only that, but if/when you don't need the diaper changing station, it easily pivots away from the playard, giving you the entire bassinet area. Lastly, this playard is easy to pack away because you are able to fold it up for storage without removing the bassinet attachment. I love features that save me time! There was only one thing I found about this playard that I would concider a drawback. It is heavy! It's probably the heaviest playard I've ever picked up--in fact, I made my husband carry the box up the stairs. The product weight is 38.5 pounds and because of it's size, it can be awkward to move. It does come with a bag to make it easy to transport, but I must admit, I wish it weighed slightly less. Now, on the flip side, I'm sure the reason it weighs a little bit more is because it has solid construction (remember, I've taken it apart and the fabric portion of this does not weigh very much!). I can appreciate that, so it's a give and take. Once set up it, it is easy to move thanks to the wheels. Would I recommend this InGenuity Washable Playard? ABSOLUTELY! I've used a number of different playards to date and this one is my favorite! Find out more about this playard and other InGenuity products by visiting their website, http://www.ingenuitybaby.com/ and make sure you follow them on Facebook too! 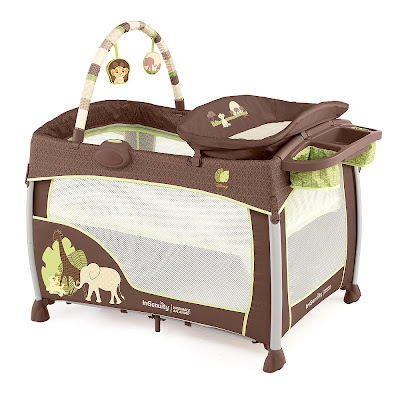 The Ingenuity Disney Baby The Lion King Premier Washable Playard is a BabiesRus Exclusive and retails for $169.99. One lucky reader will WIN one of these playards! If you've got plans to travel over the holidays and you've got little ones, a nice playard is a must! Just use the easy Rafflecopter entry form below to enter. Good luck! Would be amazing to have! The sweet pea swing looks handy!! I would love to have that. I like the Smart & Quiet Portable Swing! I also like their Perfect Place High Chair.